Christmas had finally come and Nim and Lil’ Lil were excited to get back to work. It had been a long year, waiting for the holiday season but they had both been busy planning for each day in December. 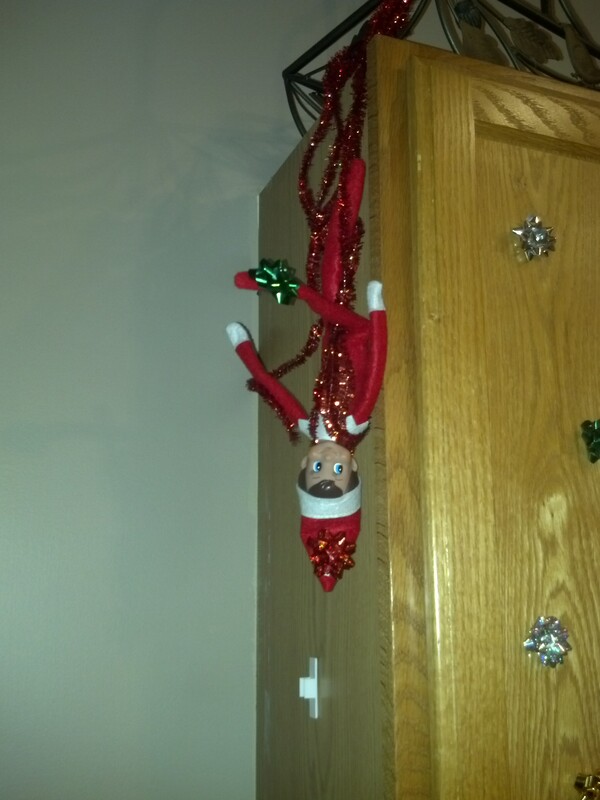 Normally, Nim was the only elf assigned to watch the Durbin boys and report back to Santa on naughty and nice behaviour. But this year, Lil’ Lil was to fly with him to the house. “But why is she coming?” Nim asked Santa, worried that he wasn’t doing a good enough job of watching the boys. “She belongs to Issabella and Cheyenne, Nim. You two will have fun planning all kinds of mischief together! Ho, ho, ho!” Santa chortled. Nim smiled and felt excited. Of course! He had forgotten that Joe’s two cousins would be at the house too. 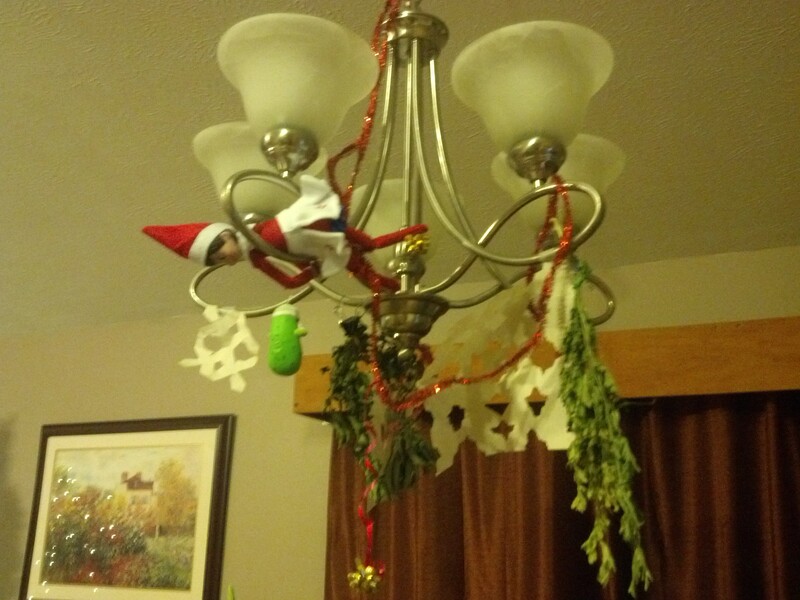 On November 30, Nim and Lil’ Lil met at the launch pad in the North Pole to fly to the Durbin’s house. Nim had a bag strapped to his back…a surprise for the kids nestled inside. Bouncing on his toes, Nim said hello and they both took off. Silently they crept into the house. It was “opening night” so they knew they had to come up with something good to greet the kids once again. Lil’ Lil got a piece of paper and red marker down from the desk. “What are you doing?” Nim whispered. 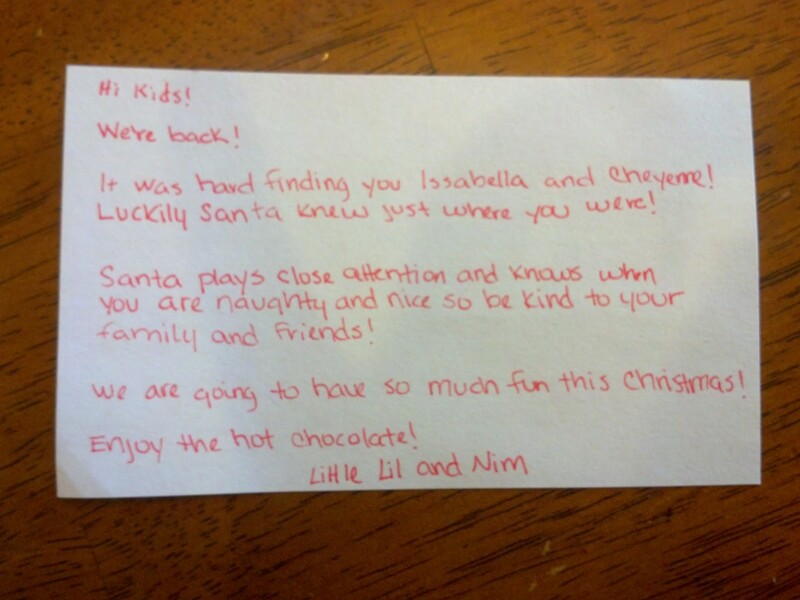 While Lil wrote, Nim opened his bag pulling out a package of hot chocolate and Christmas mug for each child. There was one extra package of cocoa in the box and Nim was feeling a bit hungry. He hadn’t had anything since his dinner of marshmallows and chocolate syrup with a side of jelly beans. He tried to be careful opening the extra packet of cocoa, but the powdery cocoa spilled on the table. Lil finished the note and pushed it over to the spilled cocoa. “Look what you did,” she giggled scooping a handful of cocoa up for herself. Then, he picked up a handful and threw it at Lil. They spent a few minutes having a cocoa fight before they spied ribbons and bows on the counter. Nim and Lil looked at each other and smiled. They knew exactly what to do tonight. Nim climbed the cabinet with a container of bows and plastered them all over. Lil flew around looking for the pickle. She found it in the Nativity behind the three wisemen. She flew back with it and picked up some bows and a tinsel rope, flying up to decorate the light fixture above the table. “Whee!” said Lil as she laughed and zoomed around the light fixture. “Be careful Lil, you’ll get tangled up,” said and grinning Nim. The warning came too late and Lil suddenly found herself tangled in red tinsel rope and paper snowflakes. Nim started to laugh. “I told you,” he said between giggles. Lil lobbed a bow at Nim and they found themselves hurling Christmas bows and ribbon at each other…Nim getting tangled in his tinsel rope too. The elves smiled and with a twinkle in their eyes, waited excitedly for the kids to wake up.